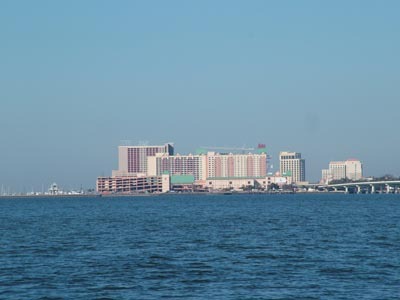 Nov 1 - As you know from our last update, we spent several days with my father in Biloxi, MS. He fancies himself as a gambler and has his own systems which he says pay off for him. Personally, I've never figured out gambling so my system is to put no money in and therefore I don't win or loose. However, there are times when I may break that rule. For instance, on Thursday afternoon late we headed over to the new Hard Rock casino and I did put five dollars in the video poker machine. Because I was "playing," I was eligible for a free drink. I was able to turn that five dollars into ten dollars in about an hour and by the way, I was able to get another free drink. So, maybe I should reconsider and next time try that strategy on the first day too. Of course my limit would still probably be five dollars. 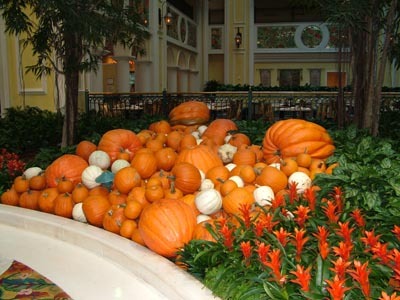 The food is always great at casinos and we were fortunate to eat at several great restaurants. The smoked ribs and the pasta were great. What I really enjoy is the decorations throughout the facility. 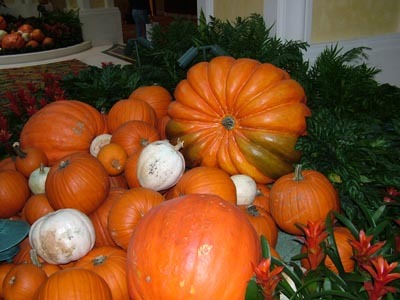 As you can see to the right, they spared no expense bringing in pumpkins. The picture to the lower left also shows another stack. They were sitting everywhere and I'm thinking pumpkin pie is in the future. 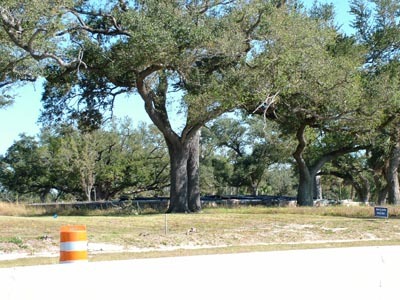 We took a drive on Thursday morning over to the new Armed Forces Retirement Center they are building to replace the one that was destroyed in Katrina. 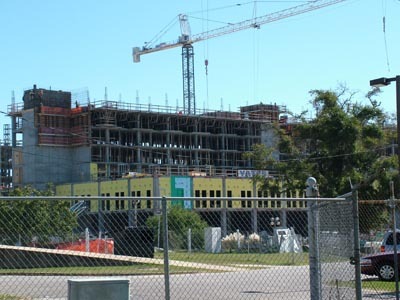 It is coming along nicely and my father plans on moving in in two years when they open. 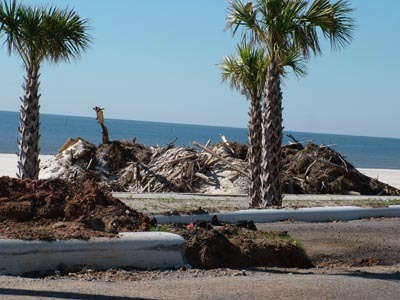 What I really wanted to write about is the devastation that is still apparent throughout the area. I would have thought, because of my ignorance, that most of this would have been gone and I might have seen something but for the most part it would be all cleaned up. 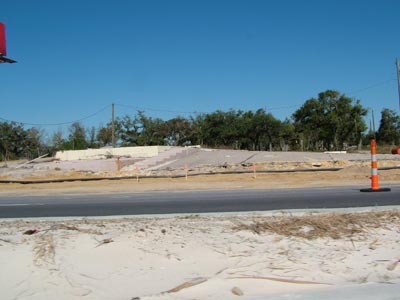 Instead, we found almost all of the homes along the waterfront were destroyed and some new ones were being built. This time they are building them in elevated fashion and I'm sure that is the only way they will be insured. 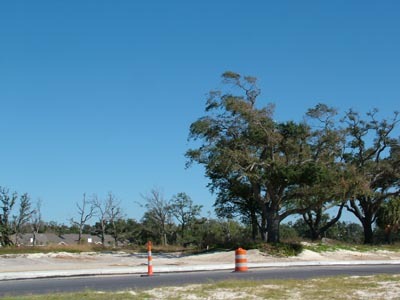 In addition, the main road is just now being repaired. Construction is happening everywhere and it is my conjecture the reason is because of the loss of tax dollars from the lack of Casino revenue. I realize I'm not helping that much but it certainly was clear the focus for the first few years was to get those casino's back on-line so the money would flow again allowing infrastructure improvements. 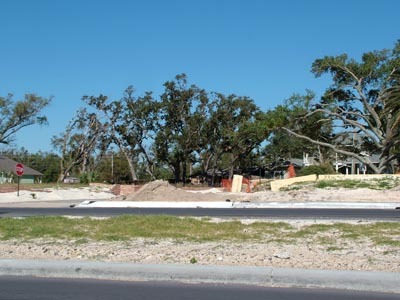 Everywhere you look there is still destruction and foundations left from the hurricane. My friend George Victory wrote a song and one of the verses says - "Katrina, what have you done?" When he completes one of his next albums, most of the revenue will go to the Katrina victims. 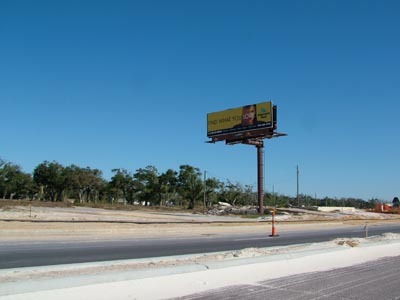 The pictures below may not look like much however, prior to Katrina there were homes and businesses everywhere. Although some are starting to come back, it is clear in contrast that there will be issues here for many more years to come. 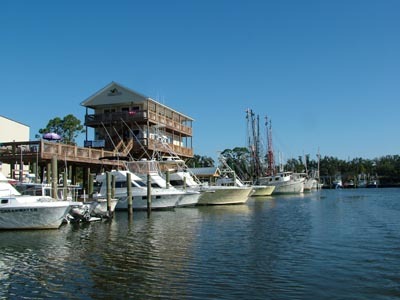 We had a wonderful stay at Ocean Springs Harbor Marina (below left) and they are about the only game in town right now. Still there are many docks without power. 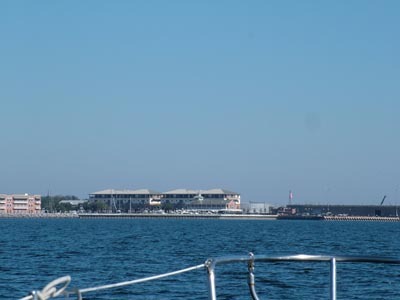 We did see the Biloxi small craft marina with docks almost complete. 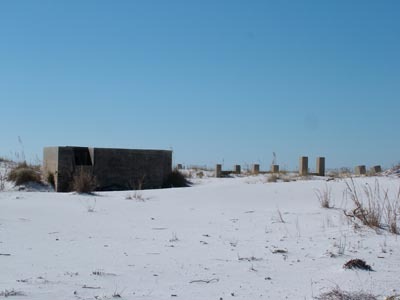 However, the building where the dockmaster's office was still had two floors missing where the hurricane either blew them out or they were washed away in the tidal surge. Below right is a picture again of the money machine for Biloxi. 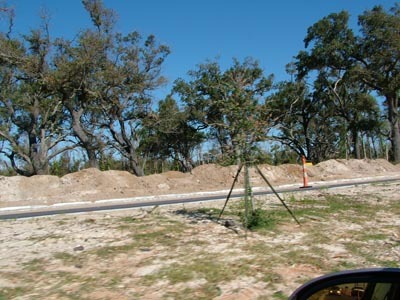 Casino's are now land based and all are now well above ground in preparation for the next hurricane. I was also struck by the low numbers of people that are in the casino's. 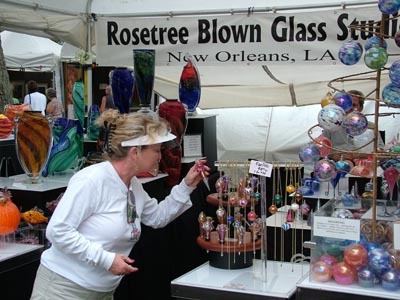 I think that has more today to do with the economy than the hurricane. Afterall, there are even some gas stations in the area where people can come down, make their deposits in the casino and then fill up their cars before returning home. We left on Friday morning to head east and of course the wind is right on our nose as I write this. The wind is supposed to go a bit north tomorrow so hopefully we will be sailing across Mobile Bay and we can turn off this motor. 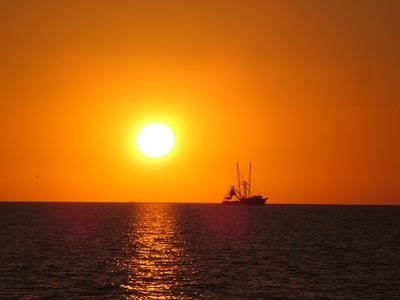 Nov 1 evening - We arrived at our anchorage last night and caught this picture of the sunset as the shrimp boats were heading out to work. 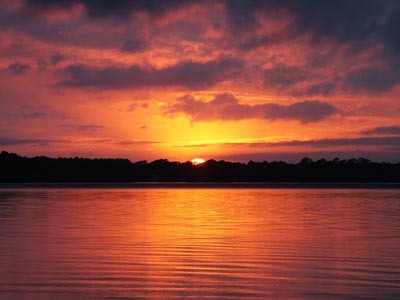 I love sunset pictures and I will have a digital picture frame filled with them when we ultimately leave the cruising lifestyle. Who knows if that will be six months or six or six + years? 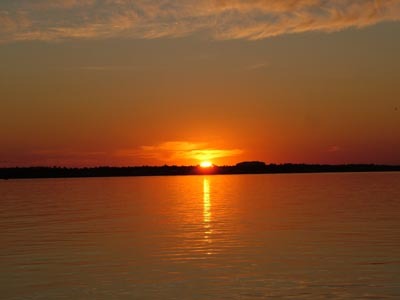 Below is another sunset picture. We arose this morning early and left our anchorage in a wind that was, of course, right on our nose. On top of that, the current was against us. Who cares we will ultimately get across Mobile Bay and the 30 + miles to get to Lulu's. If you have been reading this log for very long, you know that Lulu is Jimmy Buffett's sister and she has a restaurant along the waterway. So, that means that we MUST stop for a late lunch. We arrived at two in the afternoon and had a wonderful lunch. As a matter of fact, we had an hour and a half lunch. Life is good. We left at three thirty and were motoring, again into the wind, making cell phone calls to our weekend contacts and spotted dolphins. 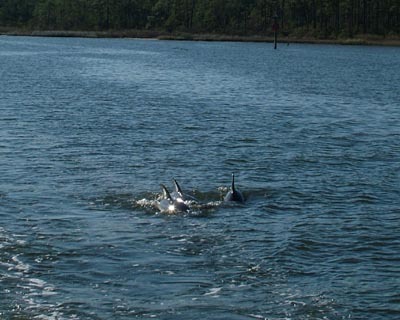 It is always wonderful when you see your first dolphins after traveling the Tenn-Tom waterway. 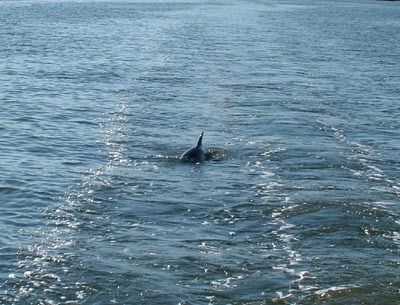 I think there is a pod of dolphins that has it in their soul to say welcome back to the sea. We anchored in about six feet of water protected from the forecasted 15 knot northeast winds. Then of course, there was that sunset. Tonight we had a different background although the sun did not disappoint. We are now in cruising mode instead of moving mode. Tomorrow I think we have an eight mile day. The next day will be a long one at about twelve miles. We will probably stay at the anchorage for a night and then move another whopping six miles so we are perfectly positioned for a Blue Angles practice on wednesday morning. 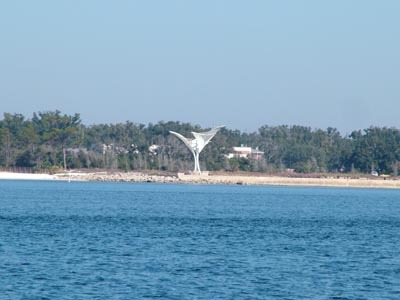 Wednesday after the practice, we will be heading to Palifox Pier again for several days in the marina to again see my father. 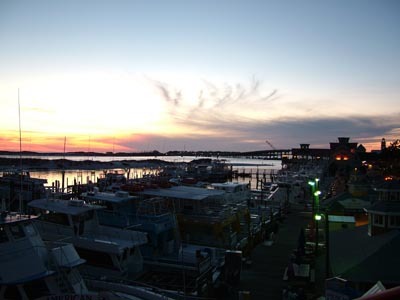 In addition, we love the old town of Pensacola. So that is our plan for spending a week to make a few miles. I don't think I ever discussed this on my website. I must ensure that I see my father when I can because I didn't see him for about twenty five years after my mother and father divorced. Given that gap, it is interesting how the relationship developed. However, one thing I have learned is how important it is for everyone to have someone. In this case that someone happens to be me and if that strikes a cord with you, call someone whom you think you should have contact with. Nov 4 - We stopped the next night in Pirates Cove and yes, the picture to the left is our dinghy. It has been put together and is ready for service. After about three months, the engine still runs wonderfully. You can see that it is all set up. 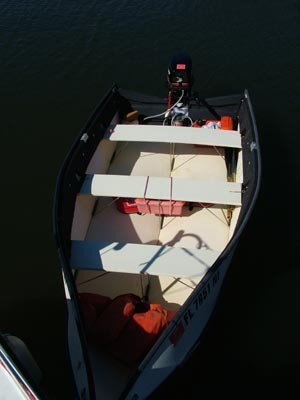 In front are our two life jackets, under the middle seat is the box that is bunged to the bottom of the seat holding our flares, spare spark plugs, wrenches, and of course our anchor. In the rear is the fuel tank and our eight horsepower engine we picked up last year in the Bahamas. It is ready to dinghy to shore. We arrived at the Pirates Cove restaurant and they have great pizza and also inexpensive wine. Just our thing. Of course the best part is the local musicians all come out for the songwriters presentation. It was great! There were two guitar players that really had a gifted hand. They played together and also with other musicians. We had a great time that afternoon listening to musicians and also watching the dogs that hung out there. Evidently, the owner likes dogs. 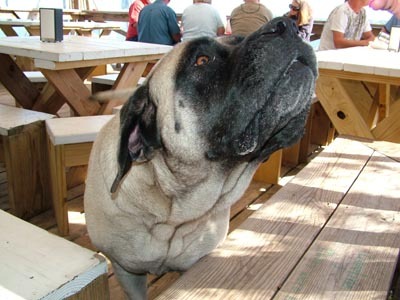 You can see one of the BIG Dogs that hang out at the outdoor restaurant. They love to beg for food and guess who this dog was looking at? Yes, it is Deb that gives in and feeds the pets. We had a great time on Sunday afternoon and then we went to the park that was just off of our anchorage. You can see the picture to the lower right. Pirates Cove is a very protected anchorage however, I really would question the quality of the water here. Too many boats that don't have sails but people live on them. To me, that means they really aren't using their holding tanks. 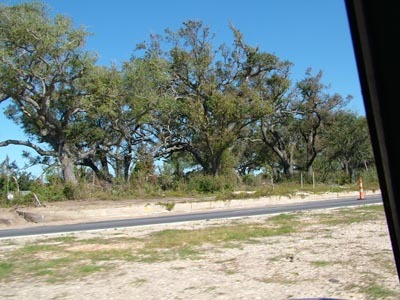 The picture to the right is of the entrance to Pirates Cove. It is narrow and as you can see, very well protected. We have fond memories of this location since this is where we first met Rob Hoffman who also had a Gemini about eight years ago. I remember many conversations with Rob about modifications and about the Gemini. He was an intelligent guy who I always enjoyed discussing facts with. Note, I didn't say arguments, he was one of those guys that you could really have a good conversation with. Ultimately he sold his Gemini but he lives with us in our dreams. We moved to another anchorage that was about six miles away and had to put in two anchors because of the tide. We went to lunch and then dinghyed back to the boat for a great evening of grilled pork loin. Today, we moved another whopping six miles and anchored just before the Pensacola pass. Then we took the dinghy and headed to shore. We had a wonderful walk on the beach picking up many shells for Deb to make necklaces with. More pieces from paradise. 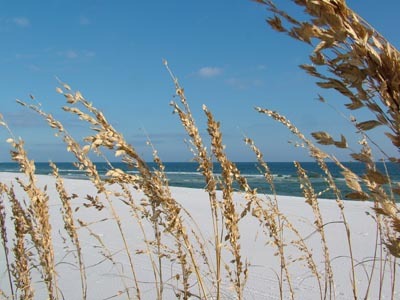 To the left you can see a picture of some of the sea oats that are on this national seashore. After picking up a bunch of shells, we headed back to the boat. We are planning on a dinner of steak stuffed with a crab stuffing tonight and truly looking forward to it. Tomorrow we are all ready for the Blue Angles practice BUT there is a new twist. Evidently there are now only three of them instead of six. The story I heard on the phone this evening is that a couple of them were not honoring the officer code and were fraternizing with each other. No doubt, wife's and husband's were involved so that is a problem. I'm looking forward to pictures in the morning and then doing a bit of research to find out what's up. Nov 5 - Well, something happened because the Blue Angles were no-show this morning. Oh well, we've seen them before and truthfully, many times. So, off we went to the marina to fill up with fuel and get our slip. We met up with my father on Wednesday afternoon and went to Crabs for dinner on Pensacola Beach. Thursday we will be going to lunch, shopping for food, and then we will come back to the boat where I'm going to cook dinner. Read that save some of this dockage money. Besides, the food we are cooking on the boat seems to be just about as good as what we are getting in the restaurant. 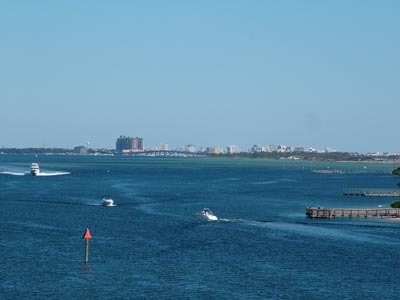 Nov 7 - The picture to the left is where we were coming through the channel heading for Pensacola. This is just before you reach the Navy Air Station. Below are both pictures of the Navy Air Station. Even at the Air Station they have art. I think that is just great. I'm not sure what it is but using my D.C. art education, I would say it a an uplifting set of wings lifting the human spirit to achieve what may otherwise be impossible. Ok, enough of that talk. 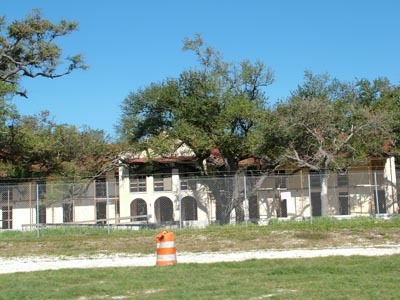 To the lower right is a picture of part of the base. It is here they train the pilots to jump into the water and survive after bailing out of a plane. On top of that, they also do quite a bit of flight training too. Of course that doesn't mention the fact this is the home of the Blue Angles and one of the finest Air Museums in existence! 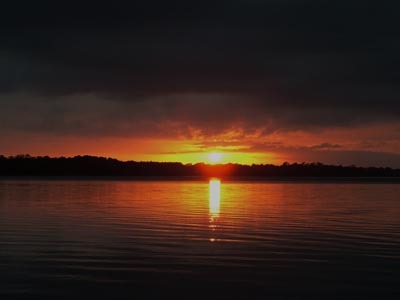 I caught this picture as we rounded the point heading for our dock space. 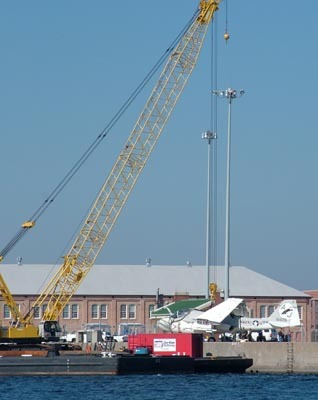 I'm not sure exactly what they were doing but it obviously had something to do with lifting this plane either on or off of the barge. 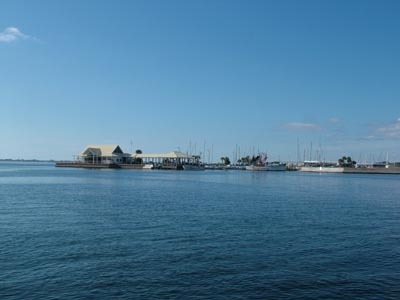 Palifox Pier is located dead ahead and this is home of one of the nicest dockmaster's in the business. Ron is great and also Drew. They are always helpful. 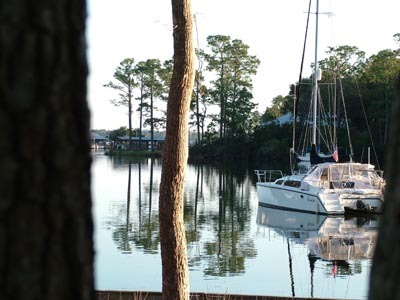 The reason we love this marina is it's easy access to the old town of Pensacola. 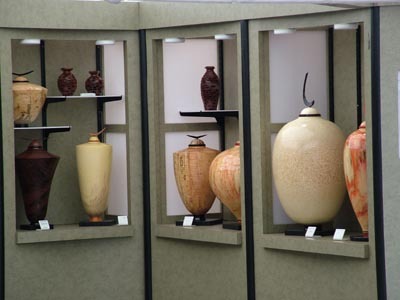 As it happened, the same art fair was in existence this weekend that was here two years ago. It is a great event since you have to be judged as worthy of getting in. The material they make is very high quality and typically the music is great too. As it happened, the weather was dreary and it was misting when we arrived. We sat down for about 20 minutes for music and then it started to rain. Of course that meant that we had to get out of there and back to the boat. The rain wasn't supposed to arrive until a couple of hours later so we weren't prepared. So it goes and we only got a little wet on the way back to the boat before it really started to rain. Thankfully, tomorrow it is supposed to be very nice and we will have north winds that will shift to the north west. That means SAILING tomorrow. 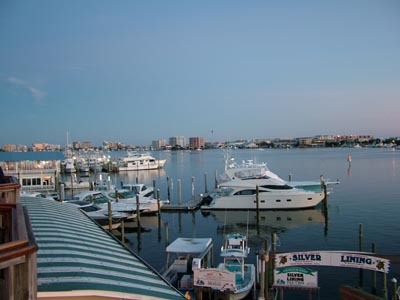 We could make it to Ft. Walton Beach in a day but won't since we can only stay at their free dock for one night. We choose to stay on Sunday so we can arrive at about noon and leave Monday at about noon. We plan on restocking the fridge and just walking the area. Who knows we may even take in a movie too. The real fun will be the sailing and no engine noise. 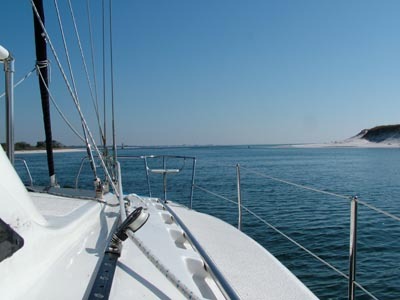 Nov 10 - We anchored out before reaching Ft. Walton Beach on Saturday night. Sunday morning, we rowed over to the bank and went for a walk. 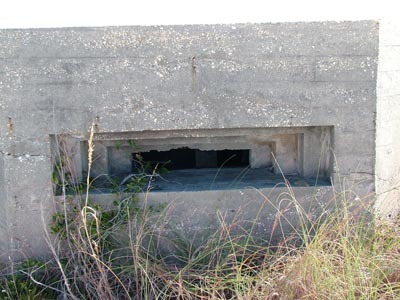 At first we saw a number of foot prints but then we crossed a road and encountered this bunker thing. You can see it to the right and lower left. We had stopped seeing foot prints and were beginning to wonder if we were on some property we shouldn't be since there were these radar installations along the bank. Oh well, they should have put up signs. We continued on past stone, oh I mean old dock hinge. 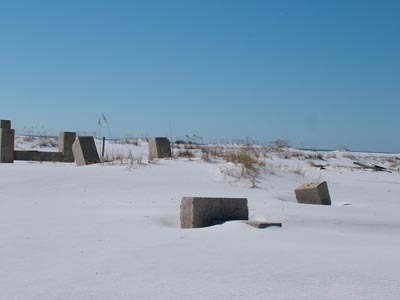 The beach was beautiful in is white sand splendor. We walked back and crossed to road again without seeing a soul. When I got back to the boat, I turned on the GPS to check the charts. Evidently we were walking in restricted territory. Who knew? We arrived at our dockage in Ft. Walton at noon. 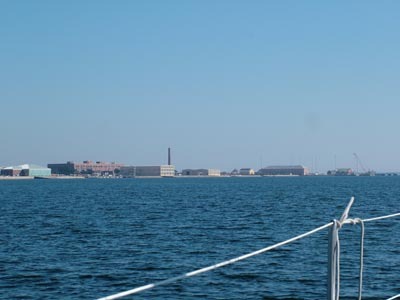 This is a cool place because you call the city manager's office and you can stay one night at the dock for free. I talked Deb into a walk and off we went crossing the bridge for the Intra coastal Waterway. On the other side there are all kind of beach shops. On the way over the bridge we caught this picture of Destin, lower left, which is our destination on Monday. Sunday evening we took off and walked a block to the movies where we were also able to have dinner. We watched some kind of a mummy movie that was an adventure film. Deb enjoyed it. Monday morning, Deb and I walked to the grocery story and for the first time in quite a while were able to shop leisurely. Normally we are with other people so it is run through the store so you don't keep them waiting. This time it was more of lets find something we've never thought of eating and try it. We did pick up a couple of things but the one we both are looking forward to are the fresh herbs that came potted that we now are growing in our enclosure on the back of the boat. We will be having those fresh herbs in salads before you know it. Lower right is a picture of the large condo complex as we approach Destin from the north side before we head under the bridge. 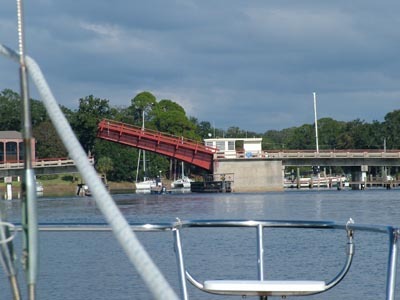 The bridges at Ft. Walton and at Destin aren't the typical height of the other bridges on the waterway. The one at Ft. Walton Beach was 48.5 feet when we went under it and the one at Destin is 49 feet. This definitely limits the number of sailboats that use this pass. 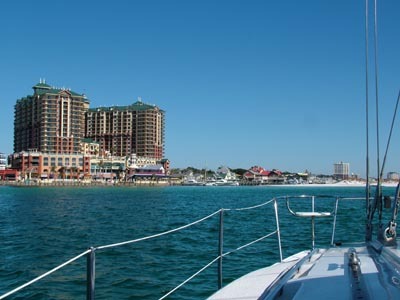 To the right you can see the entrance to Destin Harbor. 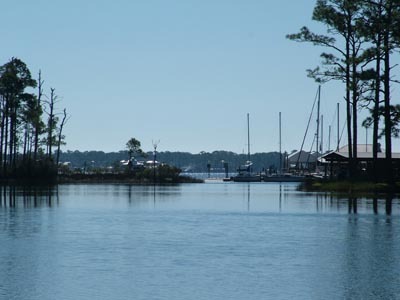 The sand point comes in from the Gulf and makes for a narrow passage into the harbor. Once you get past the shoaling, the harbor opens up. You can see some of the harbor in the two pictures below. We went in for dinner at A. J. 's and were about to tie up at the dock outside their restaurant. However, we just had to walk down to the Lucky Snapper which was one of our favorite restaurants before we started cruising. We ended up having a great conversation with a gentleman at the bar who happened to own the boat rental business along the water we had just past. It ended up he owns a T-6 warplane and fly's it regularly. We had fun talking about Oshkosh and Sun-n-Fun. 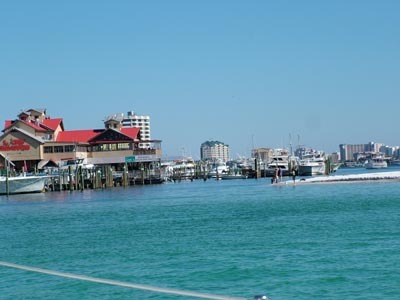 We will head back in on Tuesday to enjoy Destin and probably have lunch at the Lucky Snapper. 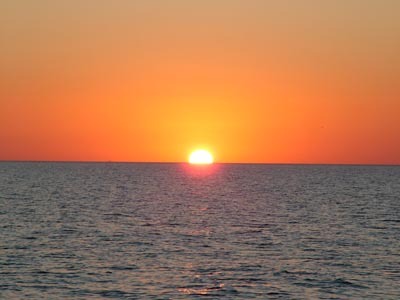 Then we are off on Wednesday for a partial day heading for Panama City. Nov 13 - We left Destin on Wednesday morning and literally beat our way into the wind for about 2 hours. This was another motor day although I've been swearing I don't want to do that. We are off to Panama City to visit some friends and we really wanted to arrive by Thursday afternoon so that means turn on the old diesel. The good news is that it settled down a bit after awhile and we were able to make our way to our anchorage just before the canal. We anchored in 4.5 feet of water and immediately Deb decided it was time for a card game. We played to 500 and she beat me 555 to 550. Then we were treated to another wonderful sunset as you can see to the right and below. 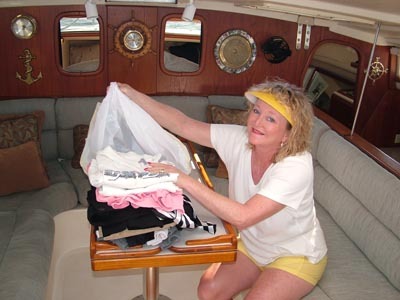 This morning, Deb got motivated and went through some more clothes that she just hadn't filtered out this summer. That means we are still in our boat weight loss program. As you can see to the lower right, Deb has a bag of clothes that we will either donate to a charity of give to someone of her size. I just chalk up another five pounds to our weight loss program. We got out of the canal at about noon and were making our way into Panama City. 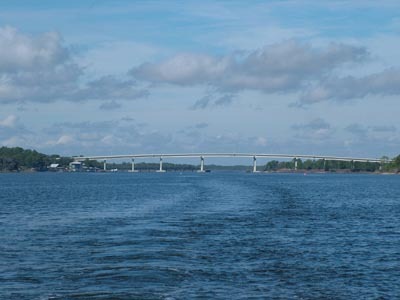 The picture to the left is the bridge that crosses over the canal on the Panama City end. 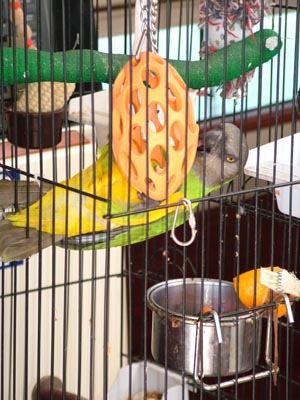 The pictures below are of our bird Jimmy Buffett. Deb has picked up a new toy for him and the holes are typically filled with peanuts. However, he already had eaten them so that means it turned into a toy for him to do his aerobic exercises. 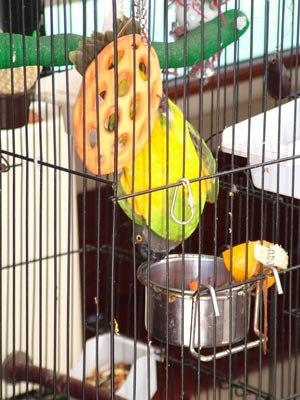 He had fun turning upside down and trying to tear it apart with his powerful beak. I'm just happy he wasn't trying to tear my finger apart. 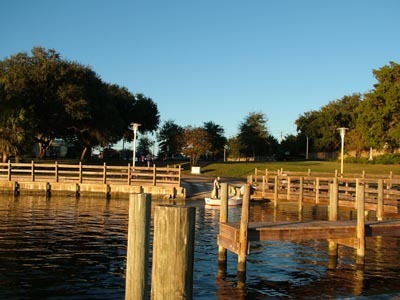 To the right is a picture of the marina just before we get to the bascule bridge that goes into the cove for Mike and Cheryl along with Larry and Susan's dock. They have friends on boats here that are also Parrot Heads and are always up for a good time. As you can see to the left, we have the bridge opening for us so we can head into the cove. I happened to forget that when I'm in Florida I have to call the bridge on channel 9 and instead was hailing on 16 until I had someone call to let me know that I was on the wrong channel. Oops. Regardless, we got through and were able to tie up to the dock. Mike dropped by after a while along with his mother and we spent some time visiting on the boat. We will be heading to dinner with them in a couple of hours and it will be great to catch up. Larry and Susan should be here on Saturday morning so we should have a great weekend too. By the way, I'm still working on my first bottle of propane since we left. That means we have gone for over a month on one bottle of propane. This is really only of interest to Gemini owners so I will let you know the secret in the next few days. It really has to do with my inverter but I will post what I did shortly. Stay tuned!